15km to the southeast of Kuala Terengganu, 5km off the coast, lies the small island of Pulau Kapas. The island extends for about 3km from north to south. On the western coast there is a series of bays and sandy, coconut palm fringed beaches with several resorts, most of them in a moderate price range. The beaches are all connected by staircases and paths and consist of white coral sand. The seawater is reasonably clear, although not as crystal clear as other east coast islands, because Pulau Kapas lies too close to the mainland. 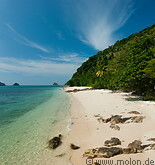 Nevertheless Kapas offers good snorkelling and diving possibilities. Near the northern tip of Pulau Kapas lies the very small island of Pulau Gemia, on which there is just one resort. Pulau Kapas is a more laid back and less busy alternative to Perhentian island, although it does not have the wild and breathtaking beauty of Perhentian island. To get to Kapas, one has to first get to the small city of Marang, and from there take a 15 minutes boat ride. The boats do not all arrive at the jetty of Pulau Kapas, which means that, depending on the arrival point, tourists have to wade the last few metres through the water to get ashore.